OK, here's my theory for 24: It's the last season so they're just going to kill everyone off and end the world. The only person left alive will be President Logan, standing on top of the pile of rubble that was L.A., shaking his head and crying "What was I supposed to do?" 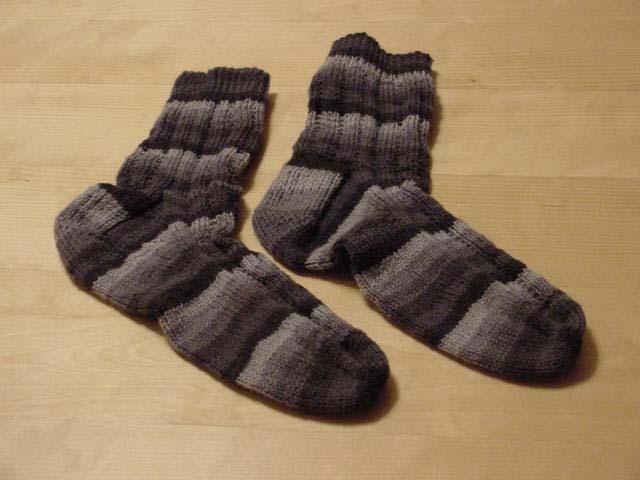 Just so you don't think I've stopped knitting, I finished the socks I started in Austin. I'm quite happy with them. They fit well. Now I get to decide which sock yarn to use for the next pair. Corned beef is in the slow cooker. I have a baaaaaaaaaaaaaaaad feeling about this . . . I am in serious mourning for Tony on 24-our beloved Chicago boy Carlos Bernard. How am I going to care about Jack saving a world that doesn't have his glowering, gorgeous best friend in it? Pull yourself together. Jack needs you right now. There will be plenty of time to mourn once all the cannisters have been found and Vladimir has been neutralized. Not sure if you are into the whole podcast thing, but I thought of you when I saw this. Thanks, Kevin. I am interested, but unfortunately my dial-up is too slow and it was taking forever to download. Maybe I can check it out next time I come visit.